If I told you this salmon recipe only has 4 ingredients, would you believe me? Because it does. Just 4 little ingredients to make one impressive dinner. 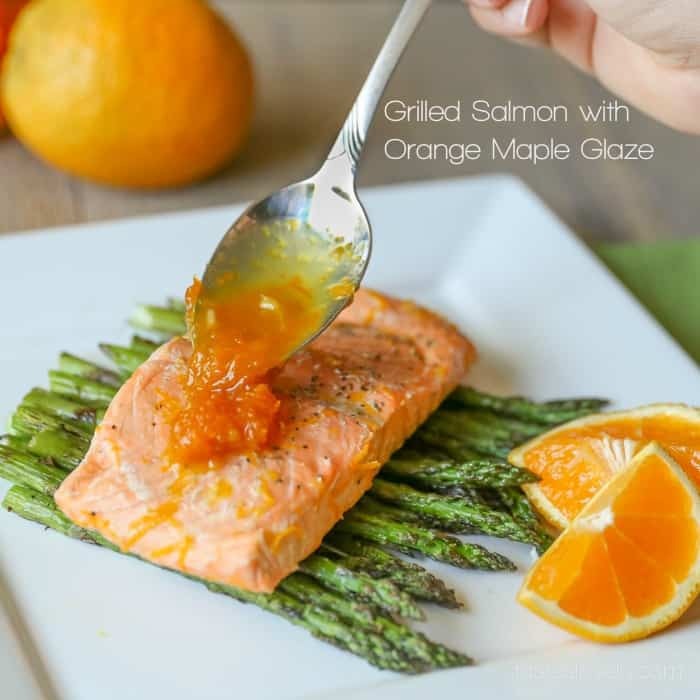 When I discovered this sweet and tangy orange maple glaze, it brought salmon to a whole new level. Best part? The marinade is only 3 ingredients. As in onetwothree. All ingredients you probably already have in your pantry. And if you’re like me and really good at math (as in, I almost majored in math, true story) then you deduced that only leaves 1 ingredient left: the salmon. Doesn’t get much simpler. 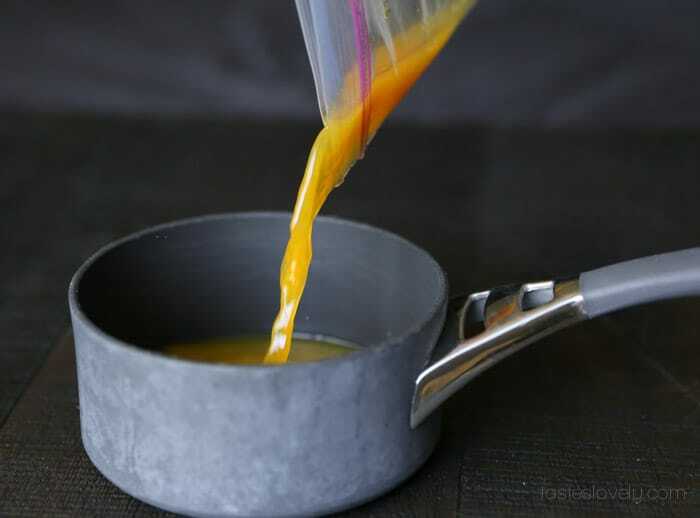 The yummy taste of this thick and sticky glaze reminds me of Asian orange chicken. Hey, I should use this to make orange chicken! 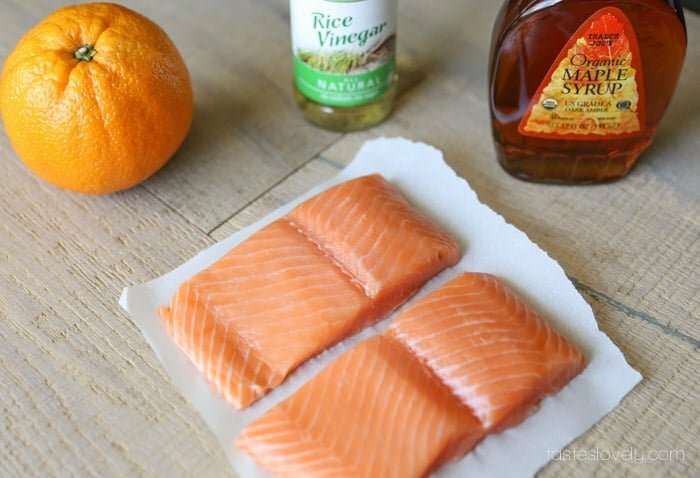 You’ll need salmon filets, a large orange, rice vinegar and maple syrup. 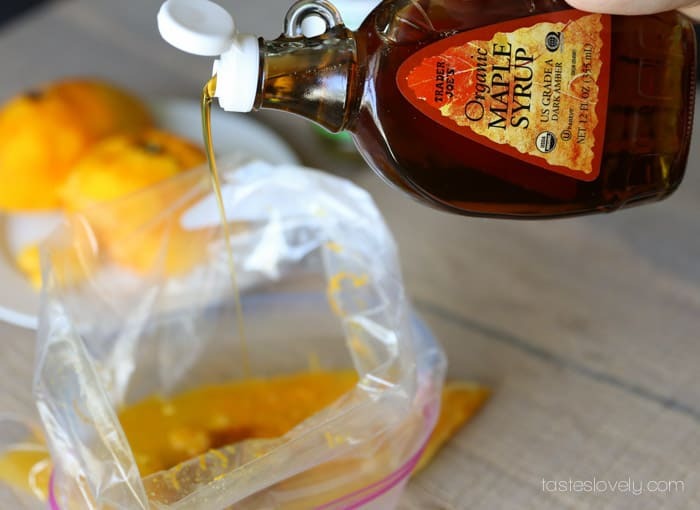 Make sure you’re using *real* maple syrup. 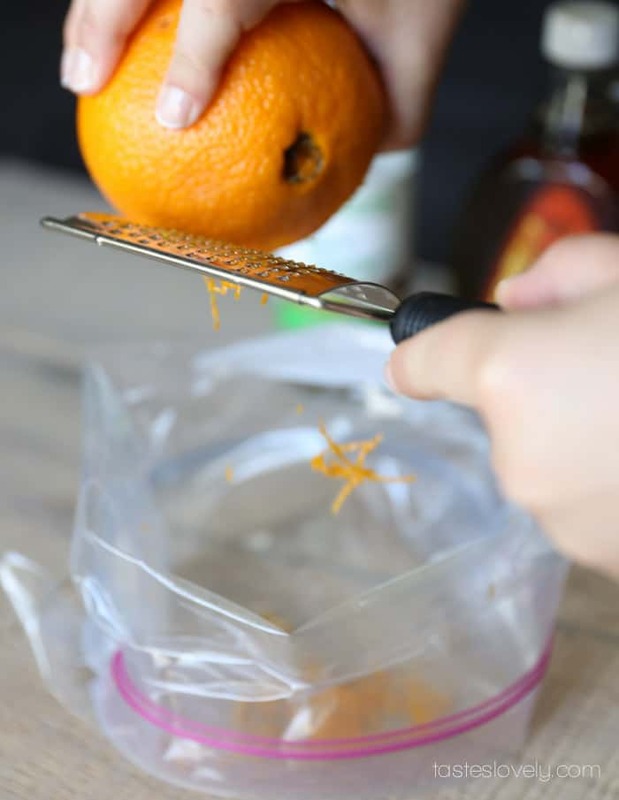 Start the marinade by zesting an entire orange. 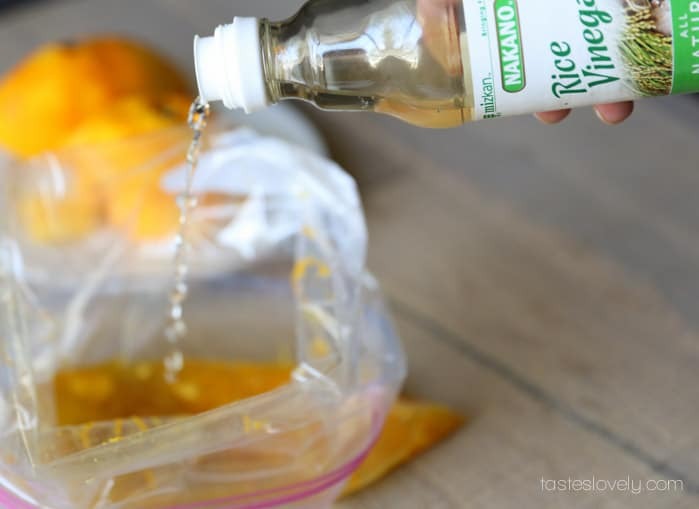 Save yourself time doing the dishes and zest it right into a ziploc bag. 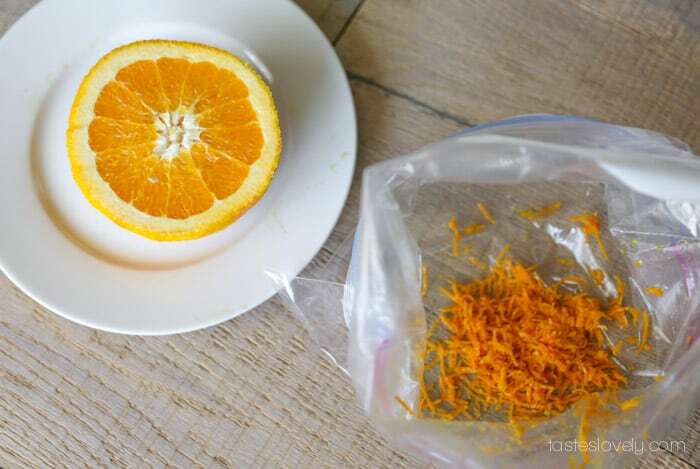 Now squeeze all the juice out of that orange. Add in that smoky and sweet maple syrup. Then add in that tangy rice vinegar. Mix the marinade around, then add in your salmon filets. Allow the salmon to marinate for at least 30 minutes and up to 2 days. While the salmon is marinating, heat up your grill over medium high and clean off the grates. 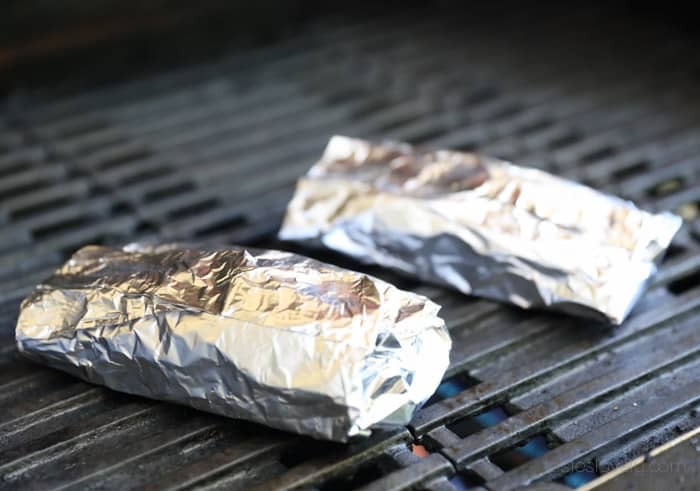 Or heat up your indoor grill grates. Salmon is a delicate fish and I hate worrying about it breaking or sticking to the grill, so I prefer to grill salmon filets in foil packets. After the salmon is done marinating, remove salmon from the marinade and shake off excess. 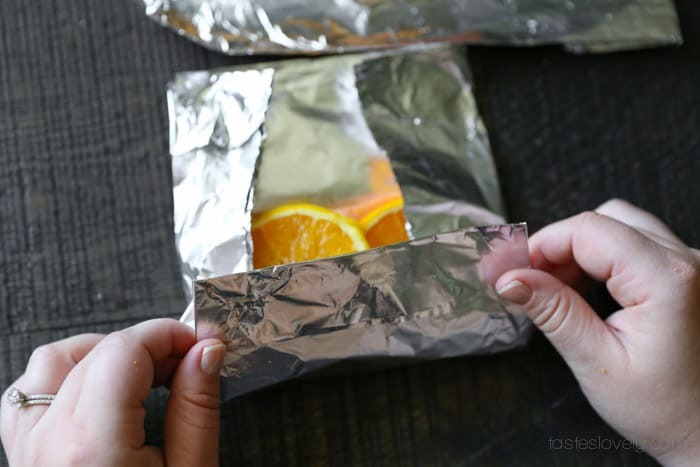 Lay on pre-cut aluminum foil, salt and pepper both sides, then top with 2 slices of orange. 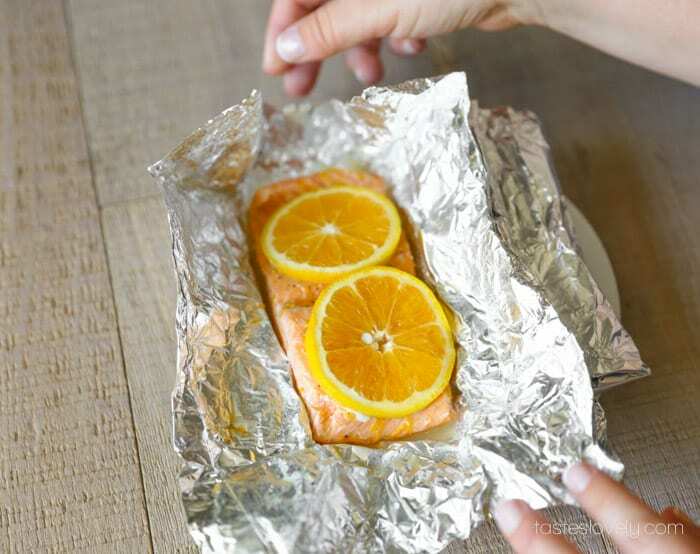 Fold the aluminum foil like an envelope to seal in salmon. Then cook on grill until the salmon is cooked through, about 10 minutes. While the salmon is cooking, pour the marinade in to a small sauce pan and cook over medium low until the sauce has reduced by 2/3. Remove the cooked salmon from the foil packets. And top with the orange maple glaze. Pairs perfectly with my grilled asparagus. 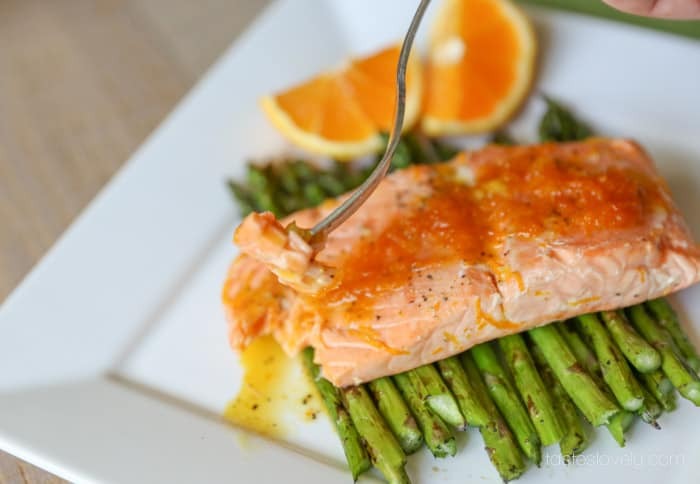 Salmon and asparagus were meant to be together. Warning, this tasty sauce is so good you may be tempted to lick your plate clean so you don’t waste a drop. Go ahead, I won’t tell anybody. 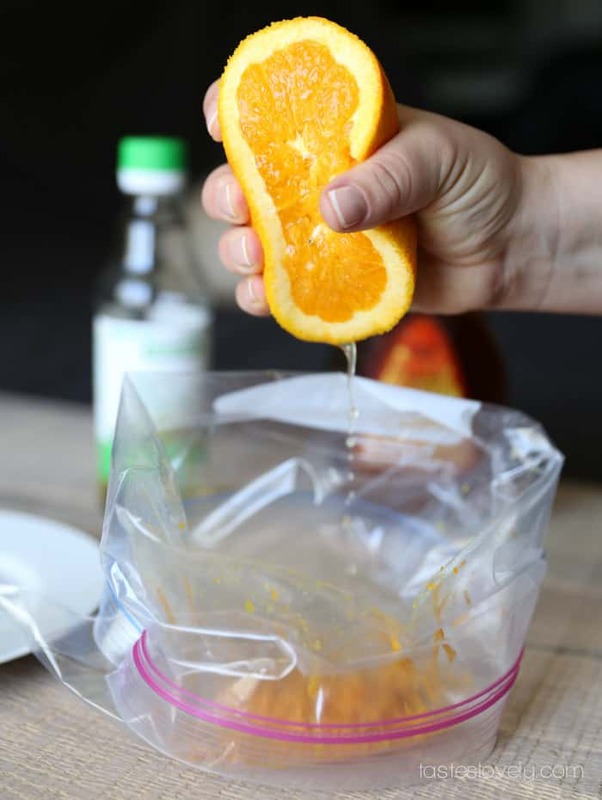 Combine the orange zest, orange juice, maple syrup and rice vinegar in a ziploc bag. Add salmon filets and marinate at least 30 minutes and up to 2 days. After done marinating, remove salmon and shake off excess marinade. 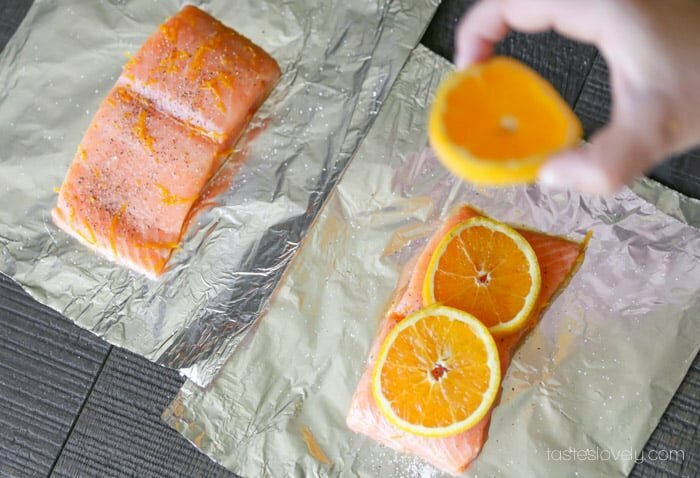 Place on precut squares of aluminum foil, salt & pepper both sides, top each filet with 2 slices of orange, and fold foil like an envelope to secure salmon. Cook on preheated grill (or indoor grill grates) over medium high heat until salmon is cooked through, about 10 minutes. While salmon is cooking, pour marinade into a small sauce pot and cook over medium low until the glaze has reduced by 2/3. 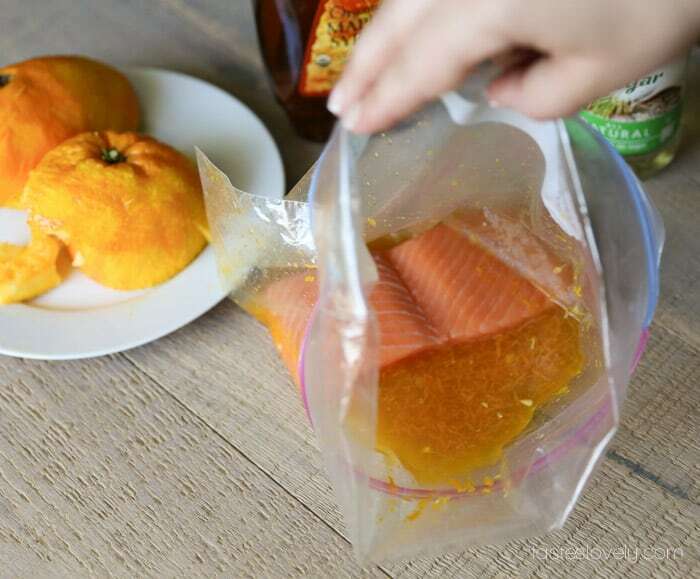 Remove salmon from foil packets and top with orange maple glaze. This looks so good! 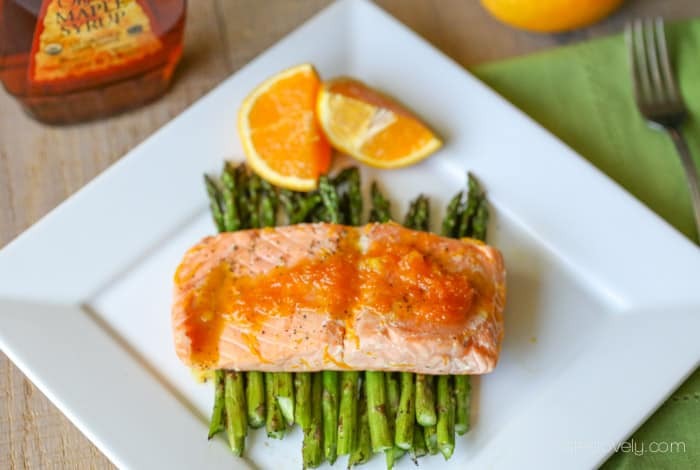 I can’t wait to make this salmon with some sweet oranges. Bookmarking! this reminds me of my summer in alaska. we would catch salmon in the river, filet them in the grass, and then cook them over the fire with orange slices on top. soooo yummy. Can this be cooked in electric oven? Want to have tonight, but it is 20 degrees here now!! Yes, I’ve done it in the oven before in the winter when it is too cold to go outside! Follow the recipe, but instead of cooking on the grill, put the foil wrapped salmon in a 350 degree oven until it is 125 degrees inside. Depending on how thick your salmon is, should be just 15-25 minutes. Hope you love it when you make it! The flavor is amazing!